I love getting a brand-new, squishy skein of yarn as much as the next knitter, but I also used to kind of dread it. 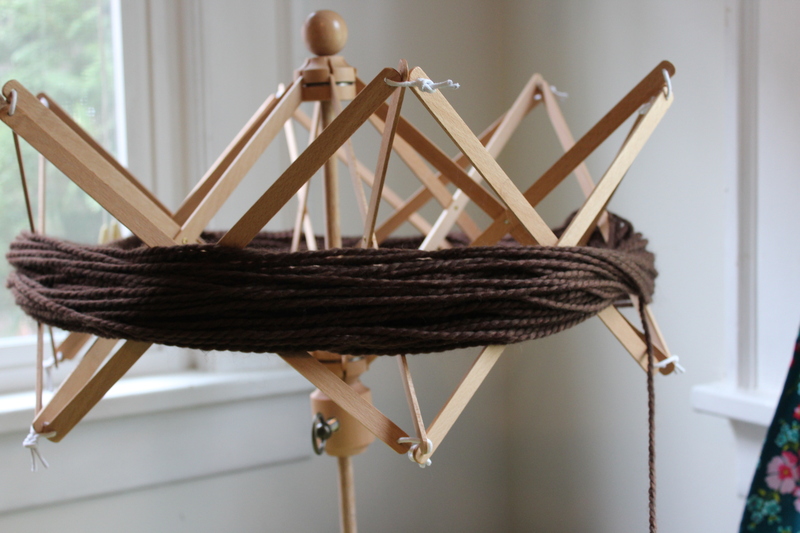 Un-raveling and balling-up a big (often tangled) skein is the absolute pits! I used to have a whole system that involved two kitchen chairs, about an hour and a lot of swearing. But then, for Christmas, my husband gave me one of my most favorite new tools! I always kind of wanted one, but never could justify buying one for myself. After all, I didn’t need it. I’d use it, if I had one, but not very often. Also, they’re a little expensive- and I hate spending money. So all that made this bad boy the perfect Christmas present. And you know what? I love it! It’s the best! It makes balling up yarn go so fast, and it’s super fun! I undo the skein, taking off any scrap yarn that was used to keep the strands together, and put the big loop of yarn around the swift. 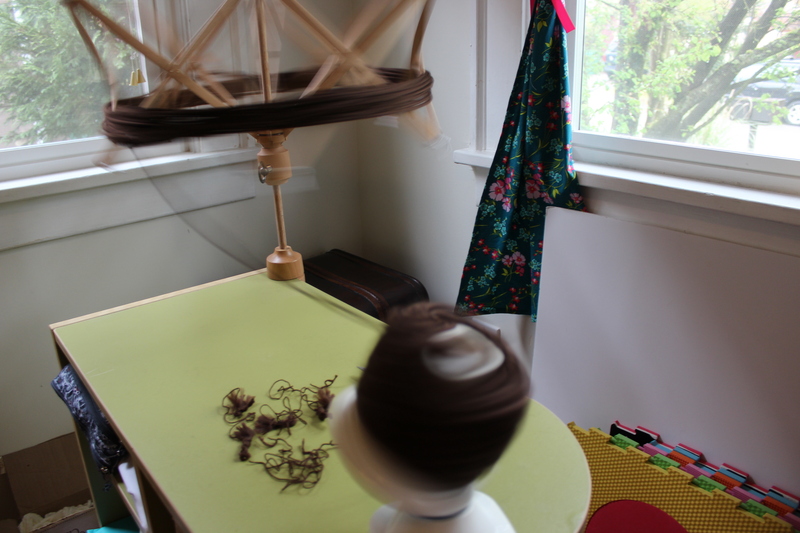 Then, I take the end of the yarn and attach it to the top of my ball winder, and away we go! (Ignore the ugly avocado-green end table that I picked up from the side of the road. It might not be pretty, but it’s very useful.) 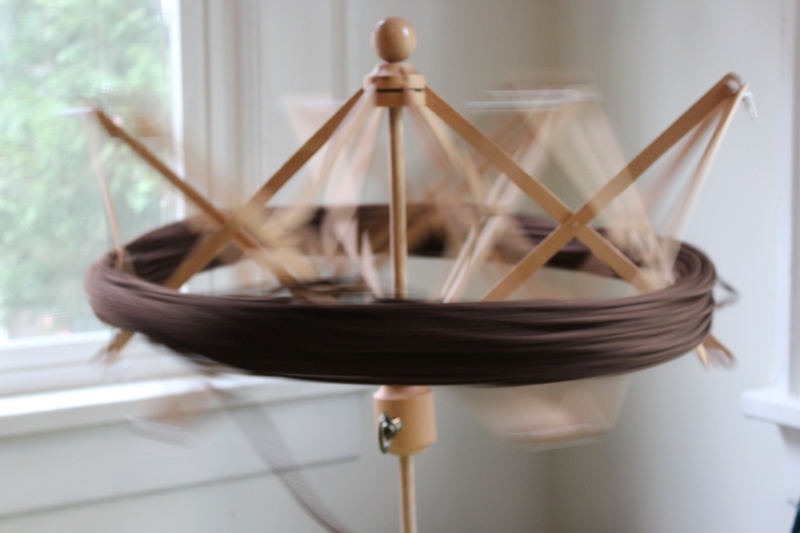 I get the ball winder spinning, and the swift twirls away, unraveling the skein without a single tangle! It’s amazing. This time, I balled 6 skeins of yarn in about 10 minutes. That would have taken me hours without my umbrella swift! Do you have a favorite not-technically-necessary-but-really-nice-to-have tool? This entry was posted in FYI and tagged ball of yarn, knitting, spinning, swift, umbrella swift, yarn on May 1, 2017 by onemilljellybeans. The avocado green desk looks actually quite nice to me 🙂 and it’s free and is “recycled”, what’s not to like? I used scraps of yarns in place of markers until I got some (I think free somehow). I can be quite thrifty, though I’m not very good at non-spending, sadly. Is that a yarn for a sweater in the making that you’re balling? I’m just getting confident enough to use the good yarns (as opposed to the box store yarns) and have been winding by hand. Yes, cursing and untangling! I think this tool may make my Christmas wishlist this year! I dont have any fancy tools but am now wanting this umbrella. It looks like it could be mesmerizing!